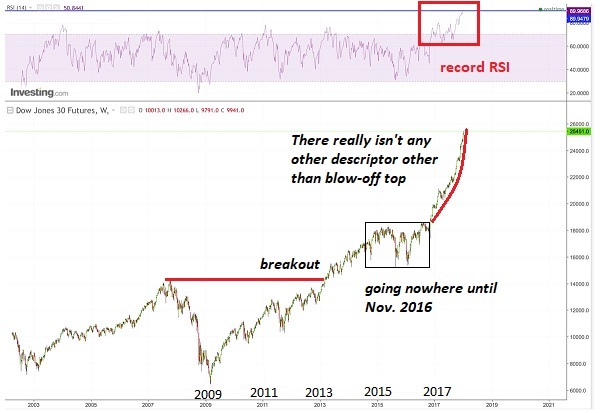 They say in 2018 their is going to be a correction in the stock market. It might be a correction of biblical proportions (a market crash). Stocks are now in a melt-up phase, and before the major bear markets start in virtually all countries around the world, we are likely to see the final exhaustion moves which could be substantial. The year will also be marked by inflation increasing a lot faster than expected. This will include higher interest rates, much higher commodity prices, such as food, oil and a falling dollar. And many base metals will strengthen. Precious metals have finished their 2-3 year correction are now resuming their move to new highs. In this bull market there have been 374 trading days without a 5% or greater pullback, the second longest streak since 1928. This is pretty remarkable considering that 5% pullbacks have occurred, on average, 3x per year since 1928. Sadly, most investors will remain convinced that current times will last forever as stocks and cryptos move to new highs. Few will realize that we are approaching the end of the biggest bubble in history. No society that depends on money can work for long if nobody knows the true value of things, including the value of money itself. The price of attempting to live in a culture of pervasive dishonesty is that an asset price re-set is inevitable. When it happens, it will be hugely destabilizing. Asset bubbles are financially destructive in the same manner as ocean waves. Their force is not linear, but exponential. A 4-foot wave has 16 times the force of a 1-foot wave; something any surfer knows from experience. We are now at the apex of the most incredible nest of financial bubbles in all of human history. I hate to break it to you, but chances are you’re just not prepared for what’s coming. Not even close. If there is a crash, unless the world ends, there will be a recovery. There always has been since the inception of stock markets. Can people lose money if they invest in something that goes bust, like tulips? Sure. But the market itself will recover. No one is going to care about the stock market when this blows up. The high stock market is a measure of inflation. People are hard wired to be optimistic so no matter how extreme the danger the worst market crash in 500 years will be all they can think about is how much money their going to make from it instead of leaving America. The middle class will be completely destroyed. That's a hard concept for most people to understand. However, people in Venezuela understand it because they have best preforming stock market in the world right now while everyone is starving. Maybe this discussion is not worth it, but I would think there are other things affecting the Venezuelan economy. Correlation is not causation. So when is the crash coming? What's going to be the thing that tips it over the edge? BofA: "This Is The Magic Number That Will Burst The Stock Bubble"
Derivatives are interest rate sensitive and there are 500 trillion of them. There are about 50 different factors that influence equity markets and so every market analyst has there own idea what will crash the markets. A massive drop in the price of oil accompanied the 2008 financial crisis you might see the same thing happen again. Dow down 600 points and Nasdaq down 144 today. This could get ugly next week if the bond market continues to sell off. Bank of America has said the stock market will crash when the yield on the 10 year T bonds hits 3%, its now at 2.84% and rising. The experts say we are headed for a "correction" in the stock market. I hope it's just a correction and not a complete market crash! I hope the whole thing comes down hard so the idiots may get their head out of their rears and figure out the reason for real money and put these socialist clowns to bed......And hopefully kills most of the sheople on the planet in the process so the ECO can try and recover! It should kill around 6 billion, that's my estimate. The Stock Market is 2/3rds margin cash. It will drop like a stone when that's all called in. The US stock market is rigged to perfection. No matter what economic news we get our nationalized market is pre-programmed to rally. Inflation is GOOD for the stock market. Negative retail sales are also GOOD. Low interest rates? Those were GOOD too. Trump was suddenly GOOD for the market in the wee hours on election night. Brexit became GOOD, as did the Italian Referendum. Low oil prices and higher oil prices are both GOOD at the same time. Continuing and ending the QE program? Both GOOD. And when a recession finally comes, it will also somehow be GOOD for the market too. by Taco » May 6th, 2012, 6:26 pm » in Business, Finance, Taxes, Investments, Cost of Living, etc.